Malta's WWII shelters are one of those really surreal, disorienting historical sites. Cut straight into the limestone deep beneath the village of Mellieha, they are a blessedly cool escape from the summer heat. But the rock also does strange things to sound, muffling and echoing it. And although many of these rock-cut spaces are large, there is always a sense of claustrophobia as you make your way through the tunnels. 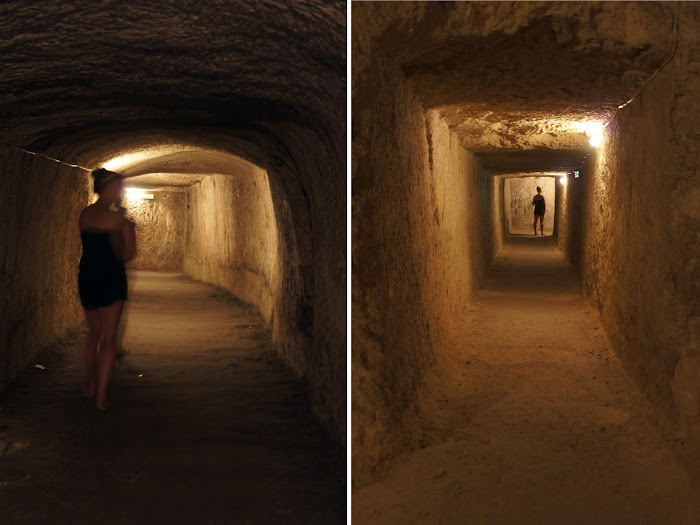 Throw in a couple of wax sculptures and 'sound effects' (air raid sirens - so chilling - and babies crying, the chip chip chip of limestone being slowly cut away) and a visit to Malta's WWII shelters are at once a deeply touching and startling experience. I can't imagine being one of thousands crammed shoulder to shoulder in these dark, twisting tunnels as bombs fell from the sky overhead. Can't imagine not knowing if you would return to the surface and have a home or not. Can't imagine not knowing when or if normal life would resume. If you want to get a sense of what it must of have felt like to live through WWII in Malta, you must make a point of visiting this strange and wonderful place. This is SO cool! And definitely a little eery too. When I was in Vietnam I did a tour through the tunnels and had a similar experience!